@Dirty Street Pie wrote: Off seasons nearly over @Bobette girls have already been cast, we’re just waiting on our Bach! Watching Todd like a hawk. Still a little early I think. By the way what’s this new ‘The Proposal’ show coming to Ten? @Sundy wrote: Watching Todd like a hawk. Still a little early I think. By the way what’s this new ‘The Proposal’ show coming to Ten? I feel like Todd ruled himself out with this post, and his Sportsbet figures have blown right out. Unless there's some next-level deflection going on, I'm not expecting it to be Todd. @Bobette wrote: This sounds like a firm no from Todd. Oh well. Maybe next year...? In fact I don't think it will be anyone on Sportsbet's current list. They proved with IACGMOOH they're still in Bed with Ten IMO (they had Richard as the odds-on winner way in advance). No idea about The Proposal. Is it like a more extreme MAFS? They're advertising for First Dates contestants on Ch 7 too - that's where Taite came from so we should keep an eye out! PAGEANT style? What is this, 1986?! Don't we have a thread for this from when it was airing in the US? It was as cheesy as you would expect. 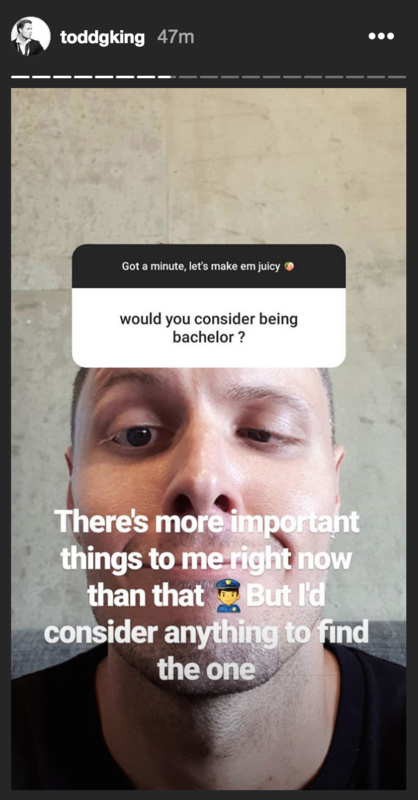 I'm confused, are we talking about the Bachelor or another show? @GuardianAngel wrote: I'm confused, are we talking about the Bachelor or another show? The only thing I've said about the proposal was saying what IMDB said the Proposal was about, in response to someone else's question. And I said that in a post otherwise about Todd. @handsanitiser The link to this quote that came from IMDB. @handsanitiser There is a need, because according to the rules, every post needs a link if the information is taken from somewhere. We are not allowed to help ourselves to post information that's not ours, according to copyright rules that would be stealing content, and we can be sued. I don't have the time to search around to find where the post came from, so I can post the link. I check every single link that's posted on this forum. Plus, I wanted the link to create a new thread for the show. Source - A link to the source of the post must be provided at all times. Any SM, any media, any quotes, anything that YOU didn't say requires a link proving where it came from which gives credit to the original poster. SM usernames are to be clearly indicted as well as the source. Clearly indicate if it's IG, Twitter, SnapChat IG Story etc. If posting an image from an IG story, we must clearly indicate the username eg IG story Username plus the link to the IG account. When posting Screen Caps, they must clearly indicate where they came from. If the poster created the Screen Cap from a youtube, or media article etc, a link MUST be provided as to where it originated. When moving a Screen Cap from one thread to another a link MUST be provided as to where it came from. When creating Screen Caps from your own source, this would be directly from a show that aired, you must state that's it's your own screen cap. When cropping resizing altering a picture/Screen Cap, you MUST state it was altered and a link must be provided as to where it originated. Under no circumstances can anything be posted from anywhere without a source linked as to the origination including typing anything word for word. We must follow the Copyright infringement law or posts will be deleted. It is against the rules to take a picture or copy an article, or a magazine article, pictures or anything from a magazine, without an online link. If the magazine is not online, then it cannot be copied and posted. Copyright rules prohibit sharing by way of taking pictures. This prevents consumers from purchasing the magazine which results in loss of revenue for their companies. Copyright rules prohibit anyone from posting any type of media SM tabloid articles etc without providing a source as to where it came from. To avoid legal action, please always provide a link.